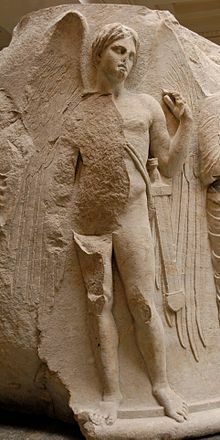 First proposed in 2009 (Source), Parthanatos (which is derived from the Greek Θάνατος or Thanatos – literally the personification of death in Greek mythology) is a form of cell death that involves very specific biological pathways in a cell. What is poly-ADP ribose polymer? Poly-ADP ribose (or simply PAR) is part of a DNA repair mechanism in cells. When a cell is put under stress, there will quite often be damage to the DNA in that cell. And given the importance of DNA, mother nature has very wisely devised several very clever systems of DNA repair to maintain the integrity of this precious molecule. One of those DNA repair mechanisms involves a protein called PARP. Poly (ADP-ribose) polymerase (or PARP) is a family of proteins involved in a number of cellular processes such as DNA repair, genomic stability, and programmed cell death. There are currently 17 different types of PARP. The research discussed in today’s post will be largely focused on PARP1, but for simplicity sake I will only refer to it as PARP. The main function of PARP in cells is to detect DNA damage and initiate a response. When damaged DNA is detected, PARP will bind to the DNA and begin to synthesise chains of poly-ADP ribose (or PAR which we mentioned above). These tendrils of PAR serve as a signalling mechanism for DNA-repairing enzymes, making them aware of the damage and recruiting their help to fix it. This is a very good system if the DNA damage is not too bad and if PARP activity is kept under strict control. But problems start to arise when PARP gets a bit carried away and becomes over activated, causing an accumulation of PAR. You see, if there is too much PAR floating around with nothing to do, it will start to cause trouble. One of the ways PAR can wreak havoc is by spilling out from nucleus of the cell (where it is usually found) and into the surrounding internal world of the cell. Once outside of the cell nucleus, PAR will head over to places it shouldn’t be, such as the mitochondria. Mitochondria can also have a powerful influence of cell survival in other ways. Theses small bean shaped objects not only provide energy for the cell, but they can also release signalling proteins which can instruct the cell what to do. For example, when PAR reaches the mitochondria it will bind to a protein called apoptosis-inducing factor, which is a protein that (as the ‘label-on-the-can’ suggests) induces apoptosis, a type of programmed cell death. PAR entering the mitochondria causes apoptosis-inducing factor to be released from mitochondria, and once unleashed apoptosis-inducing factor makes its way to the nucleus where it will start to activate regions of DNA that are involved with shutting down the cell (Click here to read more about this). Left unchecked, this process will rapidly lead to the cell dying. And this is Parthanatos in a nut shell (increase in PAR levels, causing apoptosis-inducing factor to be released from mitochondria, resulting in cell death). What does PARP or Parthanatos have to do with Parkinson’s though? Title: Inhibition of poly(ADP-ribose) polymerase: reduction of ischemic injury and attenuation of N-methyl-D-aspartate-induced neurotransmitter dysregulation. Authors: Lo EH, Bosque-Hamilton P, Meng W.
In this study, the researchers noticed that PARP levels increase dramatically in the brain after an ischemic injury (stroke), and they wondered whether blocking PARP would help or hinder the recovery. They modelled stroke in two groups of rats (one group was treated with the PARP inhibitor 3-AB and the other group were used as controls), and they analysed their brains 24 hours after the induction of stroke. The treated group were given the PARP inhibitor immediately after the stroke was induced. The investigators found that treating the animals with the PARP inhibitor significantly reduced the area of damage in the brain (the reduction was over 50%). And this finding got other researchers asking whether PARP could be involved in other neurological conditions, including Parkinson’s. Title: Poly(ADP-ribose) polymerase activation mediates 1-methyl-4-phenyl-1, 2,3,6-tetrahydropyridine (MPTP)-induced parkinsonism. Authors: Mandir AS, Przedborski S, Jackson-Lewis V, Wang ZQ, Simbulan-Rosenthal CM, Smulson ME, Hoffman BE, Guastella DB, Dawson VL, Dawson TM. Journal: Proc Natl Acad Sci U S A. 1999 May 11;96(10):5774-5779. The researchers next genetically engineered some mice that do not produce PARP and they conducted an experiment in which the no-PARP mice and normal mice were treated with the MPTP neurotoxin. The investigators found that while the normal mice lost more than half of their dopamine neurons, the neurotoxin had little (if any) effect on the dopamine neurons in the no-PARP mice. Title: A novel in vivo post-translational modification of p53 by PARP-1 in MPTP-induced parkinsonism. Authors: Mandir AS, Simbulan-Rosenthal CM, Poitras MF, Lumpkin JR, Dawson VL, Smulson ME, Dawson TM. Journal: J Neurochem. 2002 Oct;83(1):186-92. In this study, the investigators found that following the neurotoxin treatment, PARP was interacting with another protein called p53. p53 performs these functions as a transcriptional activator (that is a protein that binds to DNA and helps produce RNA (the process of transcription) – see our previous post explaining this). With regards to DNA repair, p53 is sometimes called “the guardian of the genome” as it prevents mutations and helps to conserve stability in the genome. This function also serves to prevent the development of cancer, by helping to repair potentially cancer causing mutations. In this role, p53 is known as a tumour suppressor – a mutation in the p53 gene results in a loss of this tumor suppression. And finally, in cell death, p53 plays a critical role in telling a cell when to die. And (continuing with the cancer theme), if there is a mutation in the p53 gene, fewer cells will be told to die – increasing the risk of cancer occurring. And in this role p53 is known as a tumour suppression. 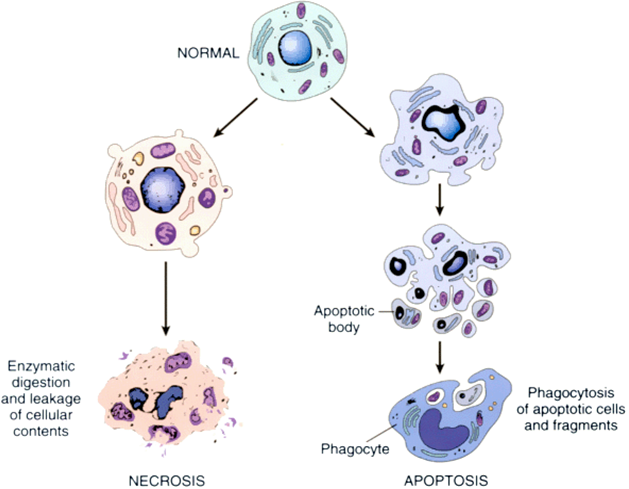 But in the absence of a mutation in the p53 gene or PARKIN to reduce the activity of the gene, p53 levels will gradually rise and instruct the cell to initiate apoptosis. What does PARP do when it interacts with p53? When PARP interacts with p53, it stablises the p53 protein – which is no good. p53 usually has a very short life span, and by stablising p53, PARP is probably seeking its help in DNA repair. But this stablisation is also increasing the risk that p53 will encourage cells to die. And the researchers suggested that it could be this influence of PARP on p53 that may underlie the mechanisms of neurotoxin-induced cell death. This finding was made before Parthanatos had been discovered, and it highlights another potential mechanism by which over active PARP could be detrimental to cells. And the finding that PARP over-activation is involved in cell death has been replicated by other independent research groups. In addition, some of those groups have extended the research by looking at drugs that can inhibit PARP in models of Parkinson’s. Title: Neuroprotective effects of a novel poly(ADP-ribose) polymerase-1 inhibitor, 2-[3-[4-(4-chlorophenyl)-1-piperazinyl] propyl]-4(3H)-quinazolinone (FR255595), in an in vitro model of cell death and in mouse 1-methyl-4-phenyl-1,2,3,6-tetrahydropyridine model of Parkinson’s disease. Authors: Iwashita A, Yamazaki S, Mihara K, Hattori K, Yamamoto H, Ishida J, Matsuoka N, Mutoh S.
Journal: J Pharmacol Exp Ther. 2004 Jun;309(3):1067-78. In this study, the researchers noted that over activation of PARP can lead to severe, irreversible depletion of the levels of NAD and ATP. What are NAD and ATP pools? Nicotinamide adenine dinucleotide (or NAD) is a protein that plays a very critical role in a wide range of cellular reactions. Importantly, it is essential for the continued production of energy by the mitochondria in cells. Mitochondria convert nutrients from food into Adenosine Triphosphate (or ATP). ATP is the fuel which cells run on, and NAD is required for the production of ATP. We have discussed NAD in a previous post on the SoPD website (Click here to read that post), and it is critical for the normal functioning of cells. Severely reducing levels of NAD can be very bad news for cells. 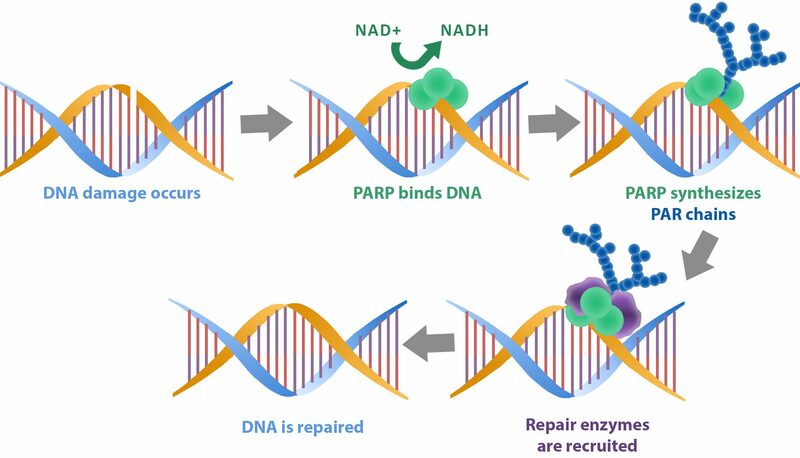 But here is the thing: NAD is also required for PARP to do its DNA repair job. You see when PARP binds to DNA it uses NAD to produce the chains of PAR that we were talking about above. So if PARP becomes over activated in a cell, it can quickly reduce the supply of NAD, causing further trouble for cells. 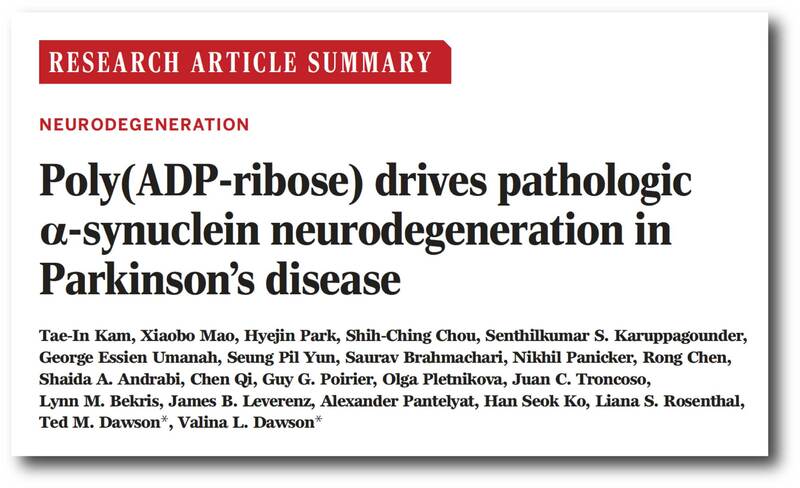 The researchers in this particular report wanted to determine if blocking PARP activity could help to rescue a neurotoxin (MPTP) model of Parkinson’s, and restore NAD/ATP levels. They used a PARP inhibitor called FR261529, which was originally developed by Fujisawa Pharmaceutical Co., Ltd (which is now part of Astellas Pharma), but this drug is no longer being developed. They injected mice with the PARP inhibitor 1 hour before giving them the neurotoxin and they found that it exerted a powerful neuroprotective effect and restored levels of NAD, which lead the researchers to conclude that PARP inhibition “could be an attractive candidate for several neurodegenerative disorders, including PD“. This same research group expanded on these results – publishing a second research report just 4 months later (Click here to read that research report). And other research groups have also replicated these results (Click here, here, and here to read some examples). Interesting. But these are all models of Parkinson’s. Is PARP actully relevant in people with Parkinson’s? Well, about the same time as these PARP inhibitor reports were being published, researcher also reported increased levels of PARP in the dopamine neurons in the postmortem brain of people with Parkinson’s (Click here to read more about this). In addition, there have been reports suggesting that genetic mutations in the PARP genes may actually protect people from developing Parkinson’s (Click here and here to read more about this). Some research groups have also found that inhibition of PARP reduces alpha synuclein levels (Click here to read more about this). Authors: Kam TI, Mao X, Park H, Chou SC, Karuppagounder SS, Umanah GE, Yun SP, Brahmachari S, Panicker N, Chen R, Andrabi SA, Qi C, Poirier GG, Pletnikova O, Troncoso JC, Bekris LM, Leverenz JB, Pantelyat A, Ko HS, Rosenthal LS, Dawson TM, Dawson VL. Journal: Science, 2018 Nov 2;362(6414). pii: eaat8407. In this study the researchers treated neurons grown in cell culture to preformed alpha synuclein fibrils. What is alpha synclein fibrils? By treating neurons grown in cell culture with preformed alpha synuclein fibrils, the researchers noted an increase in levels of both PARP and PAR, as well as an increase in cell death. When they treated these cells with PARP inhibitors, they found that the levels of PARP, PAR, and cell death all dropped dramatically. Genetically removing PARP from the cells (using CRISPR gene editing technology) also protected neurons from the toxic effects of preformed alpha synuclein fibrils. These (and other experiments) suggested that preformed alpha synuclein fibrils were primarily killing neurons via parthanatos. To confirm this result, the investigators next injected preformed alpha synuclein fibrils into both normal mice and mice that were genetically engineered to have no PARP. 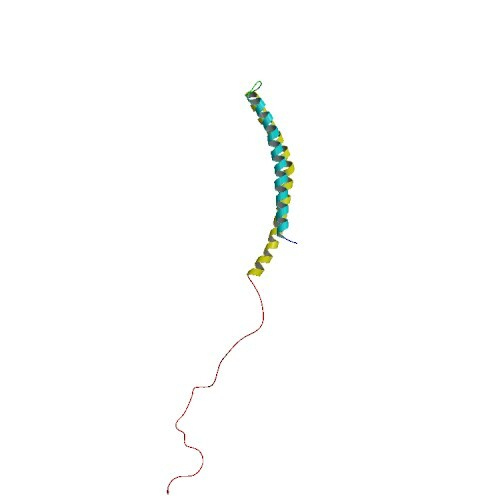 Six months after being injected with preformed alpha synuclein fibrils, the dopamine neuron population in the normal mice was reduced by approximately 50%, but the mice with no PARP exhibited no dopamine cell loss. The researchers repeated this experiment with two groups of normal mice, but they treated one group with PARP inhibitor drugs. Again, after 6 months the PARP inhibitor treated mice exhibited little if any cell loss compared to their untreated counterparts (who suffered 50% dopamine neuron loss). Now, because the rise in levels of PARP were associated with an increase in levels of PAR (when cells were treated with preformed alpha synuclein fibrils), the researchers asked what effect PAR itself may be having. When they exposed normal human alpha synuclein protein to PAR in a solution, the investigators reported a marked acceleration of protein aggregation. In addition, when they looked at the brains of mice injected with preformed alpha synuclein fibrils, they found that 20% of alpha synuclein was bound to PAR. 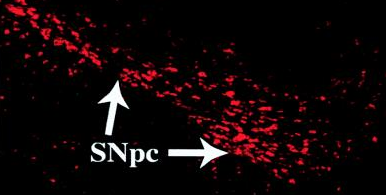 On top of this result, exposing both normal cells and cells with no PARP to increased levels of PAR resulted in increased aggregation of alpha synuclein – which suggested to the researchers that it is PAR and not PARP that directly increases levels of alpha synuclein aggregation. By treating the cells with PARP inhibitors, the levels of PAR were also significantly reduced, which in turn resulted in less alpha synuclein aggregation. This increase in PAR-induced alpha synuclein aggregation resulted in an raised levels of cell death in neurons grown in culture. And in the absence of alpha synuclein, they found that PAR was not toxic (even at very high levels). Further investigations suggested that exposing preformed alpha synuclein fibrils to PAR was causing them to adopt an even more toxic state. And this demonstrated itself further when the researchers injected either PAR exposed preformed alpha synuclein fibrils or just normal preformed alpha synuclein fibrils into mice: the mice injected with PAR exposed preformed alpha synuclein fibrils had a more rapid loss of dopamine neurons and behavioural/motor problems. Whoa! But has anyone ever looked in humans? Are there increased levels of PAR in humans? Title: Parthanatos mediates AIMP2-activated age-dependent dopaminergic neuronal loss. Authors: Lee Y, Karuppagounder SS, Shin JH, Lee YI, Ko HS, Swing D, Jiang H, Kang SU, Lee BD, Kang HC, Kim D, Tessarollo L, Dawson VL, Dawson TM. Journal: Nat Neurosci. 2013 Oct;16(10):1392-400. In this study, the researchers found that PAR levels were increased in the midbrain of people with Parkinson’s (compared to healthy control samples). This analysis was conducted on post mortem sections of midbrain – and the midbrain is where the bulk of the dopamine neurons reside in the human brain. In the report from this week which we are reviewing today, the researchers also looked at PAR levels in people with Parkinson’s. For their analysis, the investigators used samples collected from two independent groups of people with Parkinson’s (collectively over 100 individuals with PD and 61 controls), and they found increased levels of PAR in the cerebrospinal fluid (this is the fluid that the brain sits in). Intriguingly, one of those cohorts actually demonstrates an association between PAR levels in the cerebrospinal fluid and disease duration – meaning, the longer each person has had Parkinson’s, the higher their levels of PAR. Wow! Has a PARP inhibitor ever been tested in Parkinson’s? Not that I am aware of,… but we can assume that this is going to change very shortly. PARP inhibitors are currently used in the treatment of certain cancers. The most common treatment for many cancers is chemotherapy, which functions by causing fatal DNA damage in cancer tumor cells. 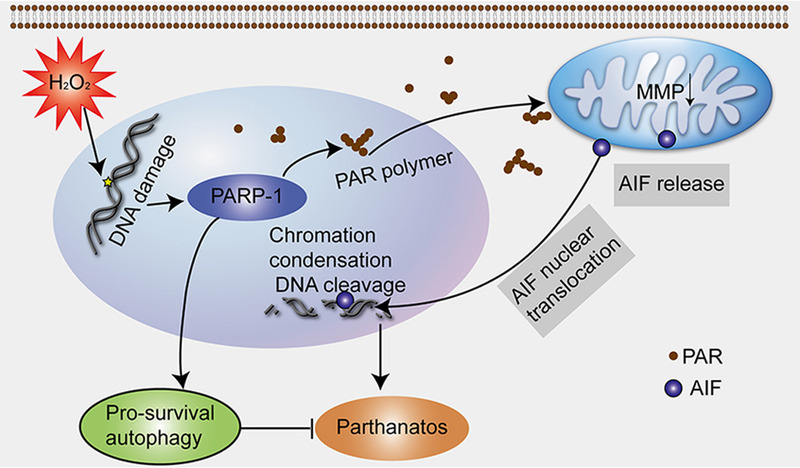 Key DNA repair pathways (like PARP), however, are hyperactive in a lot of cancers which results in increased resistance to chemotherapy treatment. But by inhibiting the DNA repair mechanism – by blocking PARP – researchers can potentiate the effect of chemotherapy, and increase the chances of killing off the tumor cells. And this has resulted in the development of numerous PARP inhibitors by multiple pharmaceutical companies for clinical use in cancer. Repurposing this class of drugs for Parkinson’s will be difficult, however, as most of the available PARP inhibitors have very poor penetration of the brain. They all have a lot of trouble getting across the blood-brain-barrier – the protective membrane surrounding our brains. And simply using higher doses of these drugs to increase levels actually entering the brain is a non-starter, due to the side effects associated with the PARP inhibitors. Side effects include nausea (generally in 50% of cases), fatigue (33%), anemia (low hemoglobin levels in the blood), vomiting, and neutropenia (low level of neutrophils, white blood cells important to fighting off infections). Thus, we will need to wait for compounds that do access the brain before such clinical trials can begin. Ideally, if those drugs could easily access the brain, perhaps we would be able to lower the dose and reduce the chances of negative side effects. But the good news is that this was an area of VERY active interest for the research field even before this new report was published – Click here to read a rather comprehensive review (written in early 2017) of repurposing PARP inhibitors for the therapy of non‐oncological conditions. 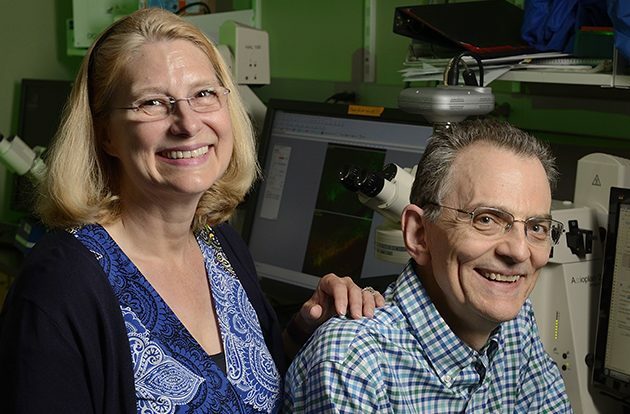 They are the husband and wife team at John Hopkins University behind not only much of the research presented in today’s post, but also providers of a lot of the research supporting other experimental therapeutic approaches for Parkinson’s (including Nilotinib and Exenatide). 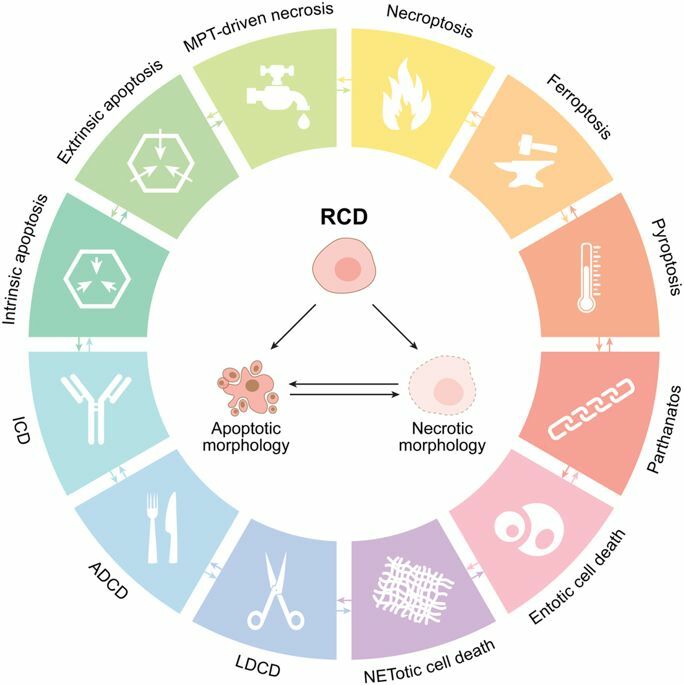 In addition, they were the first to define the Parthanatos cell death pathway (Source). Two champions of the cause who deserve a special mention here. Their labs have recently published a research report (which we have reviewed in today’s post) that suggests that the aggregated form of the Parkinson’s associated protein alpha synuclein may be killing cells via the over activation of an enzyme called PARP. PARP over activation leads to increased levels of a protein called PAR, which firstly causes cells to die by the parthanatos cell death pathway, but also accelerates alpha synuclein aggregation by causing futher aggregation – resulting in a feed-forward cycle. They have also found that treating models of Parkinson’s with PARP inhibitors reduces cell death and the accumulation of alpha synuclein, providing support for the re-purposing of this class of drugs use in Parkinson’s. As mentioned above, this alternative use of these drugs may be initially hampered by the inability of the compounds to enter the brain, but the results of the Dawson’s tireless efforts have provided yet another potential therapy for Parkinson’s and we can now expect a great deal of follow up work focused on this approach. I don’t like giving opinions on this website, but I find this new report on PARP inhibition in models of Parkinson’s to be hugely exciting. The culmination of a long sequence of dedicated research, making a fascinating and easy story to tell. And it will be very interesting to see how this situation develops. You can expect to hear more on the SoPD website regarding this topic as things progress. B. Even if I was a clinician, it would be unethical for me to offer advice being unaware of the personal medical history/circumstances in each case. At the same time I do not like to leave people with no information. So my approach to dealing with these questions is to explain what I would do if I were personally considering this matter. This way, I am providing information not advice, and the actions that you or others take based on that information would be your own responsibility. I hope you understand my position. If I was diagnosed with PD and wondering which study to get involved with, I would firstly try to learn as much as I can about myself. This process would probably start with genotyping (to determine if I have a particular genetic risk factor) followed by bloods and any other assessments I could get. And this would solely guide my decision making process with regards to which studies to get involved with. For example, if I discovered in that effort that I have a GBA or a LRRK2 variant I would be currently looking at studies such as the Sanofi Genzyme (https://scienceofparkinsons.com/2018/01/10/gsls/) or the Denali (https://scienceofparkinsons.com/2018/07/25/lrrk-2/) studies, respectively. Steve, I’m a retired cell biologist 2 years into idiopathic PD. Early on I came across vitamin D3. It is a super-promoter influencing 10% of our genome, and enhances defences to oxidative stress, cytoplasmic calcium imbalance, and inflammation. My self-designed cocktail of endogenous agents is similar to Prof Wahl’s protocol for MS. High serum 25(OH)D3 is a major component. As I see it, D3 trials for PD have been too short and over-cautious on dose. Awesome! Thanks for the great description and for the info about the Dawsons. Nice to have faces to associate with brilliant work. Seems you were right that all the emphasis on alpha syn was somewhat misplaced. Hope all is well – glad you liked the post. I found this was a really interesting topic, with intriguing potential for clinic application. Not sure the emphasis on alpha syn is completely misplaced, as this research suggests it is part of a feed-forward loop, but it will be interesting to see if PARP inhibitors can have an impact on PD in the clinic. The Linked Clinical Trials program has considered repurposing PARP inhibitors in PD for a few years, but enthusiasm has been dampened by fears of toxicity. The new data are encouraging, and perhaps lower doses of PARP inhibitors can be used with less risk, and still chances of benefit. You can read more about these ideas in Brundin, P. & Wyse, R. (2018) Cancer enzyme affects Parkinson’s disease. Science (New York, NY), 362, 521–522. November 5, 2018 - 6:48 pm Lou T.
I was wondering if perhaps a *temporary* application of a PARP inhibitor could be used to break the cycle in which PAR causes greater alpha synuclein toxicity, resulting in more damage and thus more PAR production, etc. This might be done in parallel with the application of anti-inflammatories like baicalin, curcumin and EGCg, plus mitochondrial support such as ubiquinol, to break the feedback loop that goes through innate autoimmunity. I have an impression (well, a guess) that calming feedback loops below a certain threshold through the use of multiple treatment modalities might be the key to slowing or stopping PD progression. November 5, 2018 - 7:34 pm Lou T.
Found your article (linked below), in which I think anyone reading this post would be interested. While my understanding is limited, it seems to be suggesting a combination of therapies to simultaneously and separately address both the PARP feedback loop (using a PARP inhibitor) and microglia-based autoimmunity (exenatide). I personally would place my faith more in such a multi-pronged approach than in the use of any single therapy. Thanks very much for the link. You are right – it should be of interest to all of us. Regarding your reference to “microglia-based autoimmunity (exenatide)”, here is a link that should provide some relevant information. November 8, 2018 - 7:22 am Lou T.
Thanks for that, Jeff. Prior to reading Dr. Brundin’s article, I had not been aware that astrocytes played a role in mediating the response of microglia to alpha-synuclein. I had thought that the cytokines generated by microglia (e.g., TNF-alpha) when their receptors (e.g., TLR4 and TLR2) were activated by alpha-synuclein and neuromelanin, directly triggered apoptosis (via a process that depends upon caspase-8) in neurons, including formerly-healthy “bystander neurons,” which then become damaged and release their own alpha-synuclein (and neuromelanin), starting the cycle all over again. But the article you’ve linked indicates that the cytokines actually (or also?) incite astrocytes to transform into attack dogs that then attack the neurons. So I’m still a little confused regarding how astrocytes fit in, and whether or not there is a direct effect of cytokines on neurons, in addition to the indirect one mediated by astrocytes. But anyway, if, as your linked article says, exenatide prevents astrocyte activation by inhibiting microglia, then we’re still talking about inhibiting microglia, with any astrocyte responses downstream from that. There are a number of things that inhibit microglia activation – Longvida curcumin, baicalin, EGCg, to name three. So, I’m wondering what is special about exenatide as opposed to these already-available OTC supplements. I would *think* that anything that inhibits microglial activation would also inhibit the downstream activation of astrocytes by cytokines. So, my understanding of this is very incomplete, and in particular I’m unclear on how this treatment offers advantages over the substances just named above (curcumin, baicalin and EGCg). That’s a good question (supplement vs drug). I had a look at the comment section of Simon’s earlier post on Exenatide and NLY01 (13 June 2018) and that question didn’t come up. November 8, 2018 - 7:26 pm Lou T.
That’s possibly because I haven’t gotten around to reading that article yet. 🙂 I discovered this blog kind of late and so I’m gradually working my way backwards through the posts. Unfortunately, just about everything is essential reading, and it’s extremely dense material, so this is taking a while. The research community is somewhat contaminated by drug money, but not nearly to the extent of clinical practice. In my very humble opinion. I mean, researchers are genuinely interested in anything that gets a result, but what gets funded seems to be largely drug product oriented. Especially when we’re talking about clinical trials. Exenatide is an existing patented product that already has gone through safety and other human testing, so you can see how finding other possible uses for it as a treatment for PD could be enormously profitable. Whereas, curcumin, baicalin, EGCg, aren’t going to pay for anyone’s mortgage (or new yacht). But just because the focus is very financially oriented does not mean that there won’t be interesting information and products. As patients, we need to keep asking questions about what these research findings might reveal regarding other substances for which there is little financial incentive to perform testing. Thanks for all your comments. Much appreciated. Some of these comment sections are taking on a life of their own. Exenatide is actually 12 months out of patent (it expired October 2017), but the nature of you statement still stands. I don’t think the research community is necessarily contaminated by industry money, but if industry being a new compound and says to researchers “we’ll fund you to investigate this”, few researchers are in a position to say “No thanks”. Their departments are all encouraging them to have closer ties with industry, and most scientists want to be seen to be team players in their departments. Plus industry have done away with their own research departments, so it is a necessary alliance unfortunately. I do like the idea of the patient community continuing to ask questions. That kind of engagement was one of the early goals of this website. November 11, 2018 - 10:05 pm Lou T.
Of course, the control of funds by corporations with a financial interest is part of the world in which we live. Researchers cannot be blamed for that fact, and there’s useful work to be done, even under such strictures. But patients do have to remain aware of the ways in which their interests may differ from those of the corporations who sponsor much of PD research, so that available treatments not coincident with corporate profits are not overlooked. I remember you said in an earlier article regarding exenatide that “this drug is heavily protected patent-wise (there are one hundred and forty-three patent family members in twenty-one different countries for Exenatide! Three of these patents expire this year, four more in 2018 and 2020).” So perhaps there is still some profit to be made from finding new uses for that drug. And also, I’ve noticed that not all drugs that go out of patent automatically revert to much-lower prices. I’m thinking of carbidopa, which seems to cost many times the price of sinemet that has an equivalent amount of carbidopa. I don’t know how they are able to keep prices so high for a generic drug with a manufacturing cost that is quite evidently a tiny fraction of its street price, but surely there must be some form of manipulation involved? This is something I’ve really wanted to understand, but still do not. Still, it is a great thing that research into exenatide is occurring, and that it has yielded some promising results. I am not a purist in that regard, and neither do I believe that researchers should be. We live in the world that exists, not the world as we’d like it to be. November 8, 2018 - 7:52 pm Lou T.
November 11, 2018 - 10:53 pm Lou T.
Mousing around just now, I found this very informative article that helps to answer my questions regarding how effective exclusivity can be maintained beyond the point that a generic version of a drug becomes legally possible. “Take, for example, AstraZeneca’s diabetes treatment Bydureon (exenatide) and its patents and term of exclusivity as provided by FDA’s Orange Book (the Bible of pharmaceutical patent information). AstraZeneca has 18 patents covering the product, two of which don’t expire until 2026. However, the product’s market exclusivity expires in September 2018, which begs the question: Why does a drug have patents that do not expire until eight years after a generic could potentially come to market? “Sherkow explains that this example is actually a typical case, noting: ‘Short answer here: this is the way generic entry is structured. For ANDAs [Abbreviated New Drug Applications – LT] to be approved, they need to certify that they don’t infringe any patents listed in the Orange Book … which is one of the reasons they’ll add these patents to discourage generic companies from filing ANDAs in the first place,’ particularly because of the expense of the litigation. November 11, 2018 - 11:07 pm Lou T.
And then there’s just the outright payoff approach, which under Obama apparently declined, but now under Trump will it go back to business as usual? November 5, 2018 - 6:30 pm Lou T.
One truly does get the feeling that researchers are closing in on a detailed understanding of how PD happens. It’s a very complicated picture, but you’ve made it surprisingly clear. I’m wondering, though, whether inhibiting PARP is perhaps just one part of what’s required to slow down PD progression. Where does damping down microglia-based inflammation fit into this scheme? My understanding is that when dopamine neurons die, they spill their guts (including neuromelanin and aggregated alpha-synuclein) into the inter-cellular space, and that activates microglia, which generate cytokines, causing more neurons to die, starting the autoimmune feedback loop all over again. So, once that autoimmune feedback gets started, maybe inhibiting PARP could be one part of damping it down (by reducing alpha-synuclein aggregation, and cell death from the specific cause of Parthanatos), but there would still be the dumping of neuromelanin and monomeric alpha synuclein, which I believe would still tend to cause microglial activation, even without aggregated AS as one part of that mix. More generally, there’s a difference between protecting healthy neurons (e.g., by inhibiting PARP) from the effects of a new assault by MPTP or whatever, on the one hand, and damping down the effects of an established, neuron-destroying PD process (e.g., innate autoimmunity), on the other. I’m wondering also about the cancer risk of inhibiting PARP. In PD, PARP is overproducing PAR for a *reason*, right? What *is* that reason? 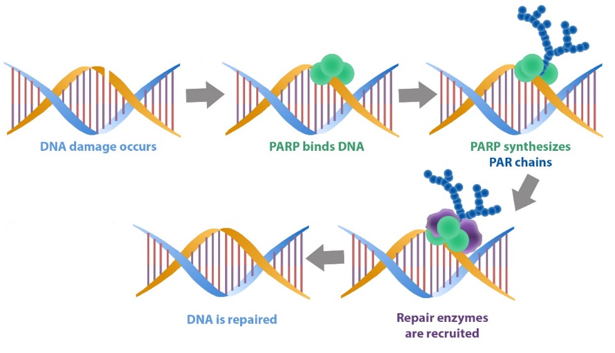 Is there extensive DNA damage that PARP is trying to repair? If so, will inhibiting PARP allow that damage to persist, and allow the neurons that contain that damaged DNA to reproduce? Or is there another process that will ensure the apoptosis of already-damaged cells before they can reproduce and become tumors (for example, p53, if that can still work without PARP to signal that there is damage)? Now, if the DNA damage is *itself* due to the Parthanatos process, then maybe inhibiting PARP *temporarily* could break that feedback of DNA damage causing too much PARP/PAR causing Parthanatos causing DNA damage, etc. And then, after that cycle was damped down, you could remove the PARP inhibitor and let PARP get back to doing its normal repairs at a normal level…? But if the DNA damage is from some other source (e.g., innate autoimmunity), then wouldn’t one would have to remove that problem in order to not need the PARP inhibitor on a continuing basis? These may be questions that do not presently have answers. Or, maybe they do, and I will be fortunate to read them here! Anyway, this seems like an amazing advance in our understanding the illness, and I am so looking forward to the hearing about the tests of PARP inhibitors in human trials. Great comment. Lots of questions. The new study suggests that rather low doses of the PARP inhibitors could be used for PD, much lower than the doses used in oncology. This means that over active PARP and high levels of PAR could be quelled while still leaving natural DNA repair processes to do their thing (hopefully). This would also reduce potential side effects. The issue at the moment, however, is that pesky blood brain barrier, but there are ways to deal with that which are being explored. Would not it be interesting to try this approach with PARP inhibitors? For that matter it might be a good idea to try it in the Prothena clinical trial where the published report stated that CSF concentration of ASN specific antibodies was only .2 or .3%? Thanks for the really interesting comment. It could be worth further investigation. Will look into it. 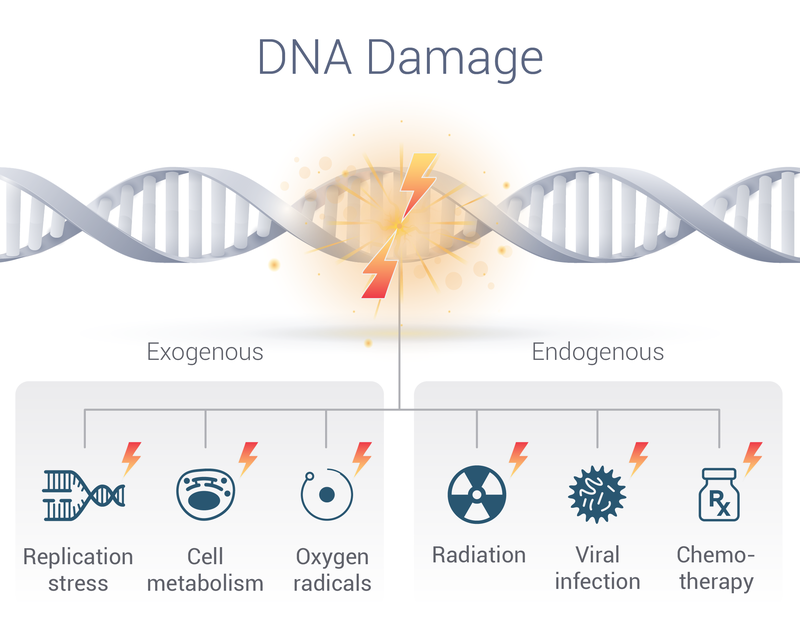 In the graphic titled ‘DNA Damage’ (credited to Sierra Oncology), are the labels for ‘endogenous’ and ‘exogenous’ stressors swapped? Exogenous means from external sources – radiation would be an external source of stress leading to DNA damage, but is under the label ‘endogenous’. Thanks for pointing out the error – you are correct and I completely missed it (Ha!). I will try and find an alternative image to replace it.